Are you missing one or more teeth? Missing teeth can not only affect the quality of your life by causing embarrassment and discomfort, they can age you and be bad for your health as well! Dr. Ryan Lanman offers a solution that is far more comfortable and natural-feeling than conventional tooth-replacement options such as bridges and dentures – dental implants! Missing a tooth or teeth does more than affect your smile – it affects your entire facial structure and the health of your jaw. Without the support of the tooth’s root, the bone beneath your teeth begins to deteriorate. In fact, 25 percent of your bone mass is lost in the very first year after an extraction! This bone is essential to the structure and balance of your smile and your face and without it, your lips will look thinner, your nose longer, you will lose more teeth, and will very likely develop TMJ disorder. You used to enjoy every minute to its fullest – smiling and laughing, chatting with neighbors, eating out with friends. Now, you feel so unattractive and awkward when you eat or laugh, you’d rather just stay home. You have lost your smile and you are embarrassed about your missing teeth or dentures. You are not alone – over 20 million people in America are edentulous. In other words, they have lost all or most of their teeth to decay, gum disease, or an accident. Single tooth replacement with an implant crown are custom crafted to perfectly blend with your natural teeth. 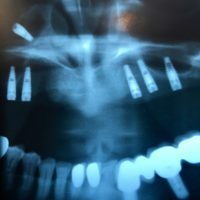 Implant supported bridges replace several teeth. These are permanently anchored to the implant posts for a beautiful and secure bridge that lets you enjoy your food and look great! Implant supported dentures help create a comfortable bite, reduce the chances of bone loss, enhance aesthetics, and improve your speech. There is no longer any need to use adhesives or worry about teeth slipping while you are talking. Some patients actually feel the new dentures have taken years off their appearance. If you are missing one or more teeth, please ask us about dental implants and start smiling – laughing – living today!